AUBURN, Ala.- The No. 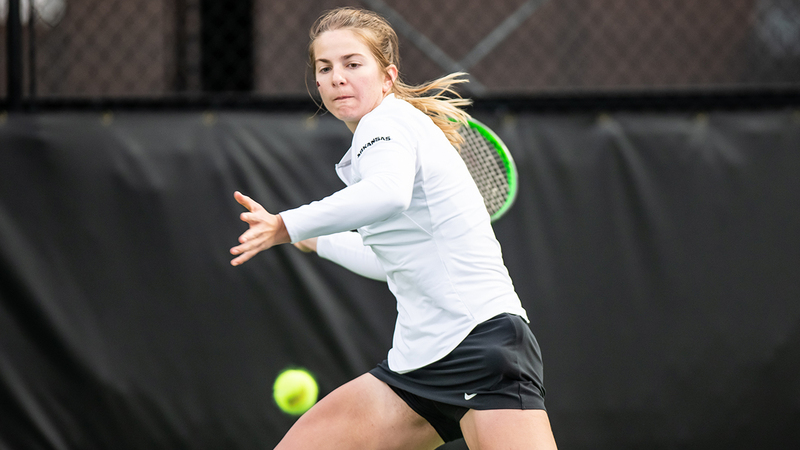 44 Arkansas women’s tennis team defeated Auburn and Chattanooga Sunday night in its regular-season finale doubleheader. The Hogs got on a roll early, taking the doubles point in straight sets. Martina Zerulo and Thea Rice earned a win at the No. 2 position, before Lauren Alter and Tatum Rice clinched the point with a 6-2 win. No. 86 Tatum Rice put the Razorbacks up 2-0, earning a 6-2, 6-3 victory at the No. 2 position. No. 88 Zerulo put the team within one of the clinch with a 6-3, 6-0 win at the No. 1 position. Junior Jackie Carr clinched the match at the No. 6 position, her third of the season. The final three matches were suspended due to the clinch. Arkansas continued its winning ways at Chattanooga, once again clinching the double point in straight sets. The Mocs retired at the No. 6 position, giving the Hogs a 2-0 lead. Miruna Tudor put the Razorbacks within one, earning a 6-3, 6-2 win before Tatum Rice clinched the match at the No. 2 position. Arkansas will return to the court next week at the SEC Tournament hosted by Texas A&M. The Hogs will face Missouri in the first round of the tournament. For more information on Razorback women’s tennis, follow @RazorbackWTEN on Twitter.